What is Expanding Consciousness? Increasing energy through the intentional connection with higher frequencies is what changes the rate of vibration. What we think and how we behave is a rate of frequency. If we change how we think and behave we raise our frequency. Access to higher frequency is how one accesses higher intelligence which are levels of higher operating sentience. Expanding Consciousness goes beyond acquiring mental knowledge in Linear Thinking and into the realm of direct cognition and higher sensory perceptual experiences. Expanding Consciousness allows one to perceive things as they really are and not what one wishes them to be. Expanding Consciousness is all about training the mind. The first thing that is important to understand is that all that exists, whether seen or unseen, when it is broken down into its simplest and most basic form of energy, consists of a rate of frequency. To begin to comprehend the nature of Consciousness, and to directly experience Expanding Consciousness through increasing personal frequency, one must go beyond flat linear thinking, thought addiction and stop accepting everything one has been told by other people as fact and truth. The public has been lied to repeatedly about the true motivation behind many world events that are used to continually steal energy resources. Stealing energy is also directly related to the theft of consciousness. Tyrants wreak havoc on the population through oppression, taking away fundamental human needs to enforce fears of survival while promoting genocide and war to feed the pillars of society that continually enforce anti human belief systems. If one seeks to improve the world, the requirement is to improve one’s consciousness in order to experience higher sentience and connection with life. As consciousness expands, so does the practice of compassionate actions. Consciousness energy consists of and is interconnected providing a distinct frequency pattern and is immediately transmitted and received, with no concept of space or time when released into the planet. Consciousness is not limited to time and space. If the rate of that vibration falls below or rises above certain intensity, it becomes immeasurable or invisible to the basic human senses. This means it is beyond the capacity of the five basic senses, such as frequency rates outside of the visible light spectrum. That doesn't mean that frequency of consciousness does not exist because you cannot currently sense it. When higher consciousness is expanded, sensory ability, levels of sentience are greatly expanded. This means that one can develop consciousness to perceive and sense energies in higher frequency ranges, and then perceive sentient beings that one was not aware of previously. During the Ascension Cycle this is a fact and it happens every day. However, since people are not given context for this happening (higher sensory perception, intuition, telepathy, etc.) they are potentially persecuted or medically diagnosed. The freedom which allows human consciousness expansion to happen naturally is not as it should be. This is one method to suppress consciousness on earth through persecution and by rejecting it as a natural biological process of human evolution. Becoming educated about Ascension, Consciousness functions and World Humanism, while committing to expand one’s personal consciousness and sentience, is one of the most effective actions one may take for the self and for the planet. If we are a person that has primarily linear, mental and social orientation, it takes devotion and discipline to reach discernment of one’s mental impulses and develop Self Awareness. Our society has developed our negative ego as the primary identity of which is recognized as the self. The stronger and more dominating the Ego Mind, the higher the academic pursuit or repetitive conditioning, those groups of people have the hardest time naturally recognizing negative ego, false identity and releasing the Mind Control. When learning about the functions of the mind it may seem like a purely educational study. However, this is the key to transcending the Negative Ego, transcending mind control which oppress higher Consciousness and suppress higher sensory and feeling functions. One cannot only think themselves to higher consciousness. One must allow the deeper feelings, emotions and sensory experience to override the strict intellectual control the ego has over the body and mind. See ES Core Triad. Practicing Meditation and developing the observer point is the critical skill which can be learned, trained and developed to discipline an unruly ego mind. With an unruly and undisciplined mind one cannot reach higher consciousness and access higher sensory perception. The process is one of self-observation and gaining increased self-awareness. Through dedicated observation of the self and gradually discerning between these functioning aspects of the mind, one can attain the direct experience of the consciousness they are. The still point of which this consciousness connects to in the parts of our mind is that which forms all of our thoughts, emotions, and experiences that direct us through life. To begin this process one must observe the functions of the mind and discern them in action and intend to return that part of that mind function, or thought back into the internal still point or neutral. As we observe the thought, action or behaviour in ourselves externally, we source this as an aspect of our mind that is connected to the internal whole and return that thought to the still point of consciousness inside our heart. In the earlier stages this is the intention and goal of specific meditation to become aware of inner stillness without the mind interfering. Later it is a walking meditation in which every single thought, behaviour and activity is witnessed by the Observer Point in the day to day activity. As this skill is developed this becomes possible with little to no effort to remain in the Observer Point. It is at this point a massive leap in higher consciousness and awareness of sentient forms may be experienced. Once in meditation there is ability to Observe, Discern and Accept thoughts back into Neutral, the next stage is to develop skill in coordinating multiple functions of the mind that happen simultaneously. Set the intention to coordinate the multiple functions of speaking, behaviour and actions while at the same time observing the inner thought process. Observing one’s communication, speaking and actions reveal the underlying thought process and belief system which is operating in the mind. When we observe our movement and words they reflect the contents of the mind. We may learn our mental and emotional state by observing our gestures, body language, our actions, behaviours and words. This is helpful for people who are not aware of their feelings on the surface and have little emotional recall. This way one can learn how to identify current states of sensory feelings. What are you feeling now? What is your body doing? What part of your body does not remain still or stationary? While observing outward actions and speech, directly observe the inner process of thoughts and feelings at the same time. In the earlier stages one may have realizations delayed later after the action occurs. The goal is to become aware at the moment, fully present to observe the outward actions and behaviours along with the inner thoughts, while they are occurring in that moment. In full presence in the now moment, observe the outward actions, behaviours or words while observing the inner thoughts and observe how all of these parts have their own function and yet are interacting with each other. This may take some practice however; this skill brings heightened awareness along with a sense of inner peace.</ref> See ES Core Triad. 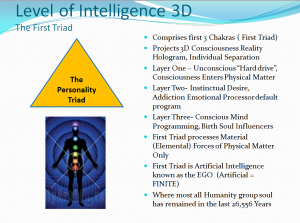 In order to understand the Internal Structures of Ego which we also refer to as “Houses of Ego”, it requires the awareness that there are three main layers the 1st Chakra of the Unconscious Mind, the 2nd Chakra of the Instinctual Mind and the 3rd Chakra of the Conscious Mind.The three layers of mind work together to serve the functions of the ego in all human beings. Each energetic layer has separate functions yet all three layers are interconnected and directly impact each other. As we learn about the layers in the internal structure of the ego, this clarifies the purpose of identifying what the ego is and how it operates within us. When we understand how Ego Filters operates inside our mind we are better equipped to heal the energetic imbalances stemming from the Negative Ego or Predator Mind. Motivation influences perception, Perception influences beliefs, Beliefs influence actions. The three major motivation problems to overcome in the Buddhist tradition are greed, anger and delusion. If these constitute much of your motivation then your perceptions, beliefs and actions can be twisted. This may also be a helpful model to help with understanding ourselves better as well as the motivation of others around us. We realize that there is so much variety in the individual Ascension Stages and our material compiled here may be overwhelming to navigate. Please take in only what feels right for you and discard the rest. However, we have some quick suggestions on how to begin right now. Take a 30 day challenge with the 12D Shield and refocusing your Ego Mind and see the results you get with daily use! The following is important information and steps to introduce you to the ES material and provide tools to utilize right away! Please browse and try out all the material as you feel guided, however, please note: the Ascension material is densely packed with information and often overwhelming for people newly acquainting with these terms. Take it in at your own pace, however, remain consistent and dedicated with your practice and you will experience many improvements, such as in mental and emotional freedom. Resolve Emotional Conflicts in the Pain Body. ES Core Triad Daily Techniques. All of these steps are a part of committing to the ES Core Triad practices every day.